2.1.1 WHAT IS A “LAGOON”? Coral reefs are built by and made up of thousands of tiny animals—coral “polyps”—that are related to anemones and jellyfish. Polyps are shallow water organisms which have a soft body covered by a calcareous skeleton. The polyps extract calcium salts from sea water to form these hard skeletons. The polyps live in colonies fastened to the rocky sea floor. The tubular skeletons grow upwards and outwards as a cemented calcareous rocky mass, collectively called corals. When the coral polyps die, they shed their skeleton [coral] on which new polyps grow. The cycle is repeated for over millions of years leading to accumulation of layers of corals [shallow rock created by these depositions is called reef]. These layers at different stages give rise to various marine landforms. One such important landform is called coral reef. Coral reefs over a period of time transform or evolve into coral islands (Lakshadweep). The corals occur in different forms and colours, depending upon the nature of salts or constituents they are made of. Small marine plants (algae) also deposit calcium carbonate contributing to coral growth. 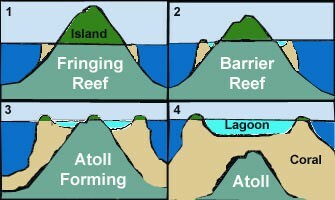 Fringing reef, barrier reef and atoll (coral islands are formed on atolls) are the most important relief features. Fringing reefs are reefs that grow directly from a shore. They are located very close to land, and often form a shallow lagoon between the beach and the main body of the reef. A fringing reef runs as a narrow belt [1-2 km wide]. This type of reef grows from the deep sea bottom with the seaward side sloping steeply into the deep sea. Coral polyps do not extend outwards because of sudden and large increase in depth. The fringing reef is by far the most common of the three major types of coral reefs, with numerous examples in all major regions of coral reef development. Fringing reefs can be seen at the New Hebrides Society islands off Australia and off the southern coast of Florida. 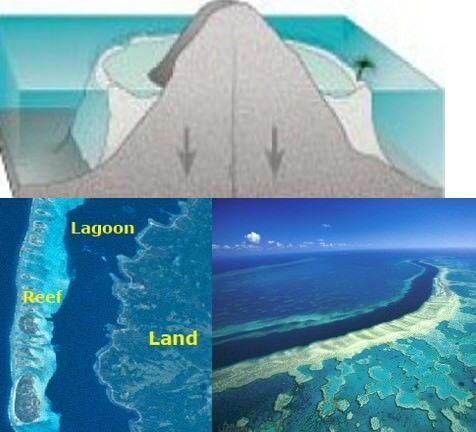 A lagoon – as used in the context of coral reef typology – refers to a comparatively wide band of water that lies between the shore and the main area of reef development, and contains at least some deep portions. Barrier reefs are extensive linear reef complexes that parallel a shore, and are separated from it by lagoon. This is the largest (in size, not distribution) of the three reefs, runs for hundreds of kilometres and is several kilometres wide. It extends as a broken, irregular ring around the coast or an island, running almost parallel to it. Barrier reefs are far less common than fringing reefs or atolls, although examples can be found in the tropical Atlantic as well as the Pacific. The 1200-mile long Great Barrier Reef off the NE coast of Australia is the world’s largest example of this reef type. The GBR is not actually a single reef as the name implies, but rather a very large complex consisting of many reefs. An atoll is a roughly circular (annular) oceanic reef system surrounding a large (and often deep) central lagoon. The lagoon has a depth 80-150 metres and may be joined with sea water through a number of channels cutting across the reef. 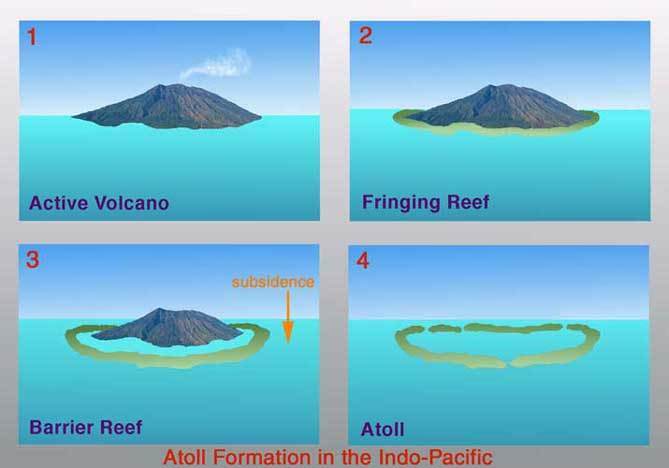 Atolls are located at great distances from deep see platforms, where the submarine features may help in formation of atolls, such as a submerged island or a volcanic cone which may reach a level suitable for coral growth. a coral island or an atoll island which is, in fact, an atoll reef, built by the process of erosion and deposition of waves with island crowns formed on them. Atolls are far more common in the Pacific than any other ocean. The Fiji atoll and the Funafuti atoll in the Ellice/Island are well known examples of atolls. A large ‘number of atolls also occur in the Lakshadweep Islands. In the South Pacific, most atolls occur in mid-ocean. Examples of this reef type are common in French Polynesia, the Caroline and Marshall Islands, Micronesia, and the Cook Islands. The Indian Ocean also contains numerous atoll formations. Examples are found in the Maldives and Chagos island groups, the Seychelles, and in the Cocos Island group. The basic coral reef classification scheme described above was first proposed by Charles Darwin, and is still widely used today. Darwin theorized that fringing reefs began to grow near the shorelines of new islands as ecological conditions became ideal for hard coral growth. Then, as the island began to gradually subside into the sea, the coral was able to keep pace in terms of growth and remained in place at the sea surface, but farther from shore; it was now a barrier reef. Eventually, the island disappeared below the sea surface, leaving only the ring of coral encircling the central lagoon; an atoll had formed. Step 1: A fringing reef forms first, and starts growing in the shallow waters close to a tropical island. Step 2: Over time, the island subsides and the reef grows outwards, and the distance between the land and the reef increases. The fringing reef develops into a barrier reef. Step 3: If the island completely subsides, all that is left is the reef. The reef retains the approximate shape of the island it grew around, forming a ring enclosing a lagoon.